Purchased a Fox TC from a member here a while back. Sent it off to JDM to get new seals and recharge. the spring was correct for my weight. Finally got around to replacing the stock pogo stick shock. What a difference! Smooth, compliant, predictable, rear feels very stable now. Just wow! Best mod for the money I have spent to date. Still need to set the sag. I can tell you that it can't be done solo (at least I can't, I tried). This install really punctuates how bad the stocker really is. the mods ive done to the suspension have been the most rewarding in terms of net performance gain per dollar spent. Well I have to say I was wrong about the solo sag set. Now I didn't do the compression/decompression steps to obtain an average with rider. Just didn't see a way to do that. I did however figure a way to measure with me on the bike. Had to back off a good bit on pre load and ended up at 35mm. I put a 1/3 of a turn back in and locked it there. Ride height now needs to be raised. Didn't have the manual with me and I dont want to f things up. I was able to reach up and get a crows foot on to the bottom of the shock and that's as far as I went. The ride was good with way to much pre load. Now set very close to optimum the bike is just amazing! I now know why everyone that has upgraded their shock is so pleased. It's an altogether different bike. Skip all the cosmetic and power mods and go straight to the shock first. 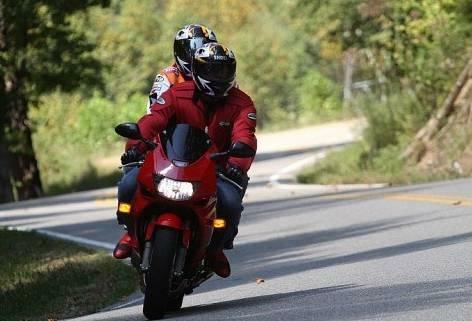 We RIDE.... Tail of the Dragon2012.. IT is the most rewarding up-grade..